This vegetable doesn’t appear to have a common English name, so I’ll just refer to it by it’s Thai name: cha-om. It’s a bitter, thorny green vegetable. The leaves (not the stems) are used, primarily made into an omelette. This vegetable can be found in the West, primarily in the freezer of South East Asian groceries. Be careful not to prick yourself with the thorn when preparing this vegetable. Storage: Store bagged in the refrigerator. Cha-om should last about a week or longer if kept dry. This vegetable has deep ridges and dark green skin. To prepare the vegetable, you cut the outer ridges and skin off, and cut the vegetable at an angle, twisting the vegetable 1/4 turn after each cut. You’re left with odd shaped pieces which, for some reason, are better. If you can’t find angle loofa, you can probably substitute with cucumber, as they both have a very mild flavor. Storage: Store in a plastic bag in the refrigerator. This will keep awhile if kept cool. 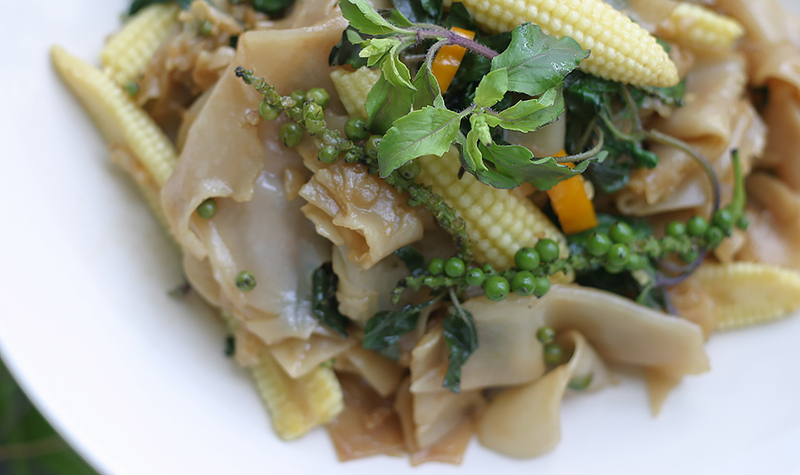 Baby corn is really good fresh. Really. Buy it if you can find it fresh (they have cute little husks too). If not, the canned will do! Storage: If you can find fresh, store it in a bag in the fridge. Otherwise, canned will last for a long time. Bananas are available all year round, and are eaten fresh, grilled, dried and made into candy. People also eat the flowers, and use the leaves for steaming. Bean Sprouts are sprouted Mung beans, a type of bean which is native to Asia. Bean sprouts are commonly eaten in many Asian countries, and Thailand is no exception. They can be eaten raw, blanched, stir fried, you name it! They are high in protein too. Storage: Bean sprouts go bad really fast. Try to eat them within a day or two. Black Mushrooms are available fresh or dried at most Chinese markets. This is a very commonly eaten mushroom in Asia. If you purchase dried, pre-soak in room temperature water for at least an hour before cooking. The water used to soak the mushrooms can also be used as a soup base. Storage: Fresh mushrooms will go bad quick, so use within a day or two. Dried mushrooms will last forever if you keep them dry in the cupboard. Bottle Gourds (sometimes called Calibash) are named so because when fully ripe, the skin becomes very hard, like wood, and people scoop out the insides and use them as containers. When not that ripe, they can be eaten! This vegetable is easy to confuse with Chinese Broccoli. It’s not the same… This one has yellow flowers, long stalks and skinny leaves. The flavor is more bitter too. It’s very common in Southern China, hence the Thai name, “Cantonese Vegetable”. I actually don’t know the English name, so if anyone does, please let me know and I can change it. Perhaps its “Edible Rapeseed”? It’s name in Cantonese is “Yao Choy”. Storage: Store your Cantonese veggie in a bag in the fridge. Make sure it’s not too wet or it’ll rot. Use it in a few days or it’ll turn yellow. Chaplu Leaves are used as a wrapper in the dish Mieng Kham. I’ve seen them eaten all over Asia, from South to East. They look similar to betel leaf, but are not bitter. This leaf is hard to find outside of Asia. If you are making Mieng, you can substitute for any mild flavor leaf. I recommend lettuce or Chinese Broccoli. Storage: Store in the fridge until ready to eat. Betel leaves don’t last that long, so eat soon. Chinese Broccoli is a very tasty green which is often found in fried noodles. I’m not sure why it’s called Chinese Broccoli in English, for the flavor isn’t at all like Broccoli… It’s called “Gai-lan” in Cantonese. You can usually buy different stages of growth at the market, from young leaves to fully old plants with flowers. The stems get tougher as they age. I prefer the ‘medium’ size ones. If you get full plants, they’ll have flowers, and the flowers will be white. Storage: Store your veggie in a bag in the fridge. Make sure it’s not too wet or it’ll rot. Use it in a few days or it’ll turn yellow. The flesh of mature, ripe coconut is used in a variety of ways. It is shredded, toasted, and eaten with savory foods, cooked into desserts, or shredded and pressed with water to make coconut milk. Cucumbers in Thailand are really small, about the length of a finger. They’re also really sweet and don’t taste watery like the larger ones in the West. If you can’t find Thai cucumbers, regular ones will do, but adjust the recipe. Cucumbers should be stored in a plastic bag in the refrigerator. Storage: Store cucumbers sealed in the refrigerator. When they start getting soft and wrinkled, they’re too old. Fermented White Soybeans are mild and creamy and slightly fermented. They are used to make broth and in a few dips. Storage: White soybeans are usually sold in a bottle. Keep that bottle sealed in the refrigerator. Even though Papaya is actually a fruit, when eaten unripe it’s not sweet at all, and is crunchy like a vegetable. So forgive the mis-categorization! Green, unripe papaya is shredded to make the famous spicy Thai salad called Som Tum. Green papaya is available in most Asian markets. The skin should be a dark forest green, the flesh a light greenish white and the seeds white. The seeds turn brown and then black as the fruit ripens, and the flesh turns light pink/orange before turning dark orange when ripe. If you get an unripe papaya which has started ripening (ie, brown seeds), try to use the flesh on the outer part of the fruit, the whiter/greener the better. Storage: Store unripe papaya covered in the refrigerator. The longer you store, the more it will ripen, so use it sooner than later. If making som tum, you can shred the papaya and leave in a bag in the refrigerator for a day or two before making. This eggplant is furry and sourish. Make sure to remove the hair before eating. Storage: Store bagged in the refrigerator. It’ll last about a week if kept dry. Ivy Gourd (coccinia grandis) is a common ‘weed’ in Thailand. I see people pick it all the time off sides of walls and such, bring it home and eat it! It’s a type of climbing ivy, with ivy-shaped leaves and curly bits. It’s got a mild sweet flavor, somewhat like spinach. If you can’t find this vegetable, substitute with a mild tasting green. The limes in Thailand are smaller, juicier and have thinner skin. They are not the same version I was used to in the US. However, they are the same which are grown in Mexico, Central America, Caribbean, and the Florida Keys. In the US they are referred to ‘Key Lime’, since they are grown in the Keys. The ‘key lime’ is native to South East Asia, and was brought over to to Central America & the Caribbean by the Spanish, via the Middle East. Since the limes are different, instead of calling for ‘1 lime’ in my recipes, instead I call for the juice by the teaspoon, so there is no confusion. As for some recipes, where you actually eat the rind, for example: Mieng Kham, it’s better to try to find thin skinned ‘key’ limes. Storage: Keep limes in a plastic bag in the fridge or they’ll dry out. Limes are much better fresh. As they age, the juice becomes bitter, and that bitterness can overpower the flavor of your food. Always use fresh limes! Long beans are used in curries, stir-fries, and Som Tum (Green Papaya Salad). They’re crunchier than regular green beans. Storage: Store long beans in a bag in the refrigerator. They will last a pretty long time. Long Green Eggplants have a very mild flavor, and are excellent stir fried with garlic, bean sauce and Thai basil. The skin is very soft, so be careful not to bruise. If you cannot find Long Green Eggplant, you may be able to substitute with the skinny purple Japanese eggplant. Storage: Store these eggplants in a plastic bag on the bottom shelf of the refrigerator. Ma-groot is usually called ‘Kaffir Lime’, but recently I read that ‘Kaffir’ is actually an ethnic slur(!) in South Africa and elsewhere. So instead, I’ll just use the Thai name. Ma-groot are a type of citrus, related to lime, but with a completely different smell and taste. The juice (what little there is) is not used. The skin of the fruit is used in curry pastes, and the leaves are used to flavor soups, curries and more. It may be next to impossible to find fresh ma-groot outside of Thailand. You may be able to find frozen or dried. If frozen, double the amount called for in the recipe, as freezing the fruit makes it lose flavor. If dried, pre-soak to soften, and use three times what the recipe calls for. Thai mangoes are sticky sweet, really juicy and fragrant when ripe. There are many different types of mangoes in Thailand. ‘Naam Dok Maai’ (pictured left) is the most common. This is the type of mango which is eaten with the famous Thai dessert, Mango with Sticky Rice. Mangosteens are really sweet and sticky, and they have cute little green hats on top. Oyster Mushrooms have a mild flavor and are very soft. They are usually eaten in soups and sometimes stir fried. Storage: Store in a plastic bag in the refrigerator. Oyster Mushrooms go bad fast, so eat them quickly after you bring them home. If they’re slimy, they’re too old. They should be firm(ish) and dry. Pickled Radish is preserved with salt, and is usually bought pre-chopped into fine bits. I believe it’s made from Daikon radish, but I’m not totally sure. It’s thrown into Pad Thai as well as eaten with Rice Soup. Storage: Pickled Radish is preserved already, so if you store it in the fridge it should last a very long time. There are two main types of Pineapples grown in Thailand, the softer and sweeter ‘Sri Racha’ variety grown in the coastal areas around Bangkok, and the crunchier and more sour ‘Phuket’ variety grown in the South. Pineapples grow very easily here, and are exported all over the world. In Thailand you can get a 1/2 of a Pineapple cut up for you into bite size pieces in a bag for $.25 USD — Thai version of ‘fast food’! Thais also eat savory food with Pineapple. The most common dishes are ‘Fried Rice with Pineapple’ and ‘Red Curry with Pineapple’. These mushrooms are commonly eaten in Thailand. When bought fresh here they have yet to poke out of the ball-stage, so they don’t look much like mushrooms, more like little balls. When you slice them open you can see the mushroom-shape inside. They are sold young, before they’ve opened. Storage: Store in a plastic bag in the refrigerator. They will last about a week or so if fresh. This vegetable doesn’t seem to have a common English name. The name in Thai literally means ‘sweet vegetable’, so that’s what I’ll call it here. It’s scientific name is ‘Melientha Suavis Pierre’. This vegetable has a slightly sweet taste, and is usually eaten in soups. Tamarind is a very sour and slightly sweet fruit which grows on huge trees in Asia. There are many varieties of tamarind which area eaten, ranging in size and tartness. People also use tamarind paste made from squeezing the fruit with water to flavor soups and curries. Taro is a purple root vegetable which is grown in the tropics. It is often made into desserts such as bua loi. Storage: Store bagged in the refrigerator. It’ll last a pretty long time if kept dry. Thai Eggplants come in all shapes, sizes and colors, ranging from tiny green pea eggplants), to medium sized green and white striped eggplants — Purple, yellow, white, you name it. They all have a slightly bitter taste, and flavor quite unlike Western or Japanese eggplants. 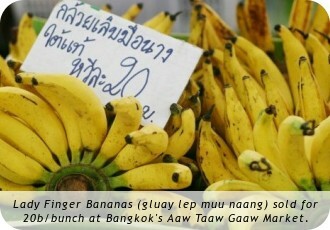 They are most commonly eaten with dips or in Green Curry. Thai pumpkin has a dark green knobby skin, orange flesh and white seeds. The flavor is more like a squash than pumpkin. If you can’t find Thai pumpkin at your Asian grocer, I believe Japanese pumpkin can be substituted. By no means use the jack-o-lantern variety. I’d be scared to find out what happened if you used that. Yuck! Storage: Store Thai Pumpkin sealed in the bottom of the refrigerator. It’ll keep for a week or two. Tomatoes are used in some salads, such as ‘Som Tum’, and mostly eaten raw. Use the medium-size deep red tomatoes, the ones with the most flavor. Storage: Store tomatoes in a plastic bag on the bottom shelf of the refrigerator. Water Spinach is a vegetable found all over SouthEast Asia. I’ve heard it called by so many English names: water spinach, swamp cabbage, water convolvulus, water morning-glory, morning glory… In any case, learning it’s Thai name is easier: Pak Boong. Storage: Store water spinach in a bag in the refrigerator. It goes bad fast, so use within 2-3 days. Wing Beans are a squarish shaped bean. When you cut them they resemble an “X”. They have a mild flavor, and are used in thai salads (yum) and eaten with chili pastes (naam prik). They are commonly eaten with coconut milk, roasted chili paste, peanuts and toasted coconut in wing bean salad. Storage: Store long beans in a bag in the refrigerator. They won’t last long and will turn black fairly quickly, so use up soon. Winter melon is in the same family as cucumber, and has a very mild flavor. It’s usually used in soups, but you can also stir fry it or eat it any way you like. I’ve even seen Thais use it as an incense stand! The melons can get quite big, weighing in at around a kilo a piece. Storage: Winter melons will keep for a long time if you store them sealed in the refrigerator.